IT firms in India were forced to implement business security plans following the terrorist attack in outsourcing hotbed Mumbai. The attacks, which killed an estimated 100 people, disrupted the work of IT outsourcing suppliers based in the city and created a human resources emergency plan. UK supplier Capgemini has more than 20,000 staff in India with 5000 of these in Mumbai. The company has ensured its 25 UK staff in India are safe and implemented a policy of no travel to Mumbai. "Until further notice nobody goes to or via Mumbai [on Capgemini business]," said Robert Ingram, vice-president of human resources at the firm. He said regular movement of Capgemini staff between the UK and Mumbai is common. He said the company has contacted all UK staff that are in India, established where they are, and ensured that they have the appropriate security. Ingram said the company has offered all UK staff in India, who are involved in training and development, the opportunity to return to the UK as quickly as possible. "We are helping people leave quickly and some are now leaving early," said Ingram. The company said it is also helping its Indian staff who are currently in the UK and are concerned about their families. Indian outsourcing supplier Satyam said it has checked on all of its staff at two units in Mumbai. "All our associates in Mumbai are safe and we have heightened security in all our locations," said Satyam. Staff at Tata Consulting Services working in the company's South Mumbai office have been relocated to the North Mumbai building, because of restrictions placed by Indian anti-terrorist police. 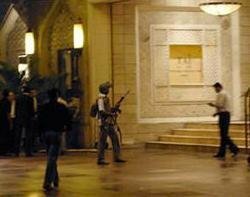 The company said that because anti-terrorist police operations continue around the affected Taj and Oberoi hotels, which were targeted in the attacks, restriction have been placed on movements around South Mumbai. In a statement, the company said, "TCS' operations in North Mumbai are open and functioning as usual. A team of TCS experts continue to monitor the situation continuously and the company has very well established business continuity plans in place should the need arise to implement them."